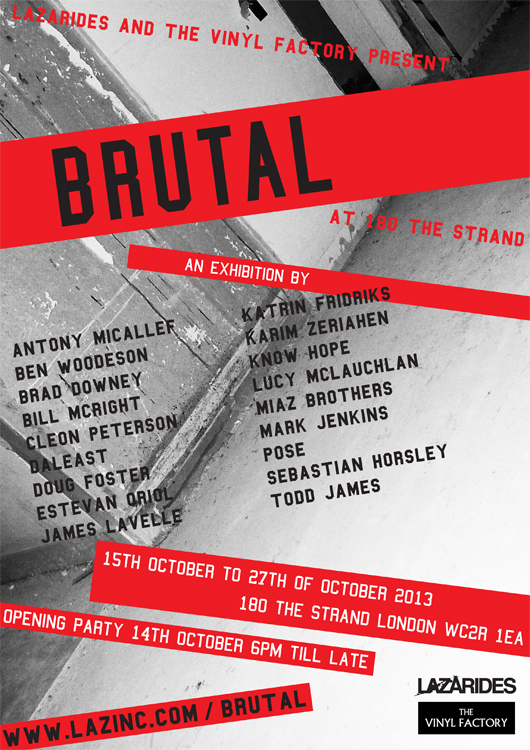 Last night I got the chance to see an exhibition called Brutal with my good friend Mel. After stopping in at a couple of stores and snagging a bargain each we were ready. Sadly I took us the complete wrong direction to start with and we ended up at McDonalds. Once we had refuelled and Mel had checked a map, we were once more on our way to what we expected to be a pretty cool gallery. Turns out it was being held in the basement of an unused and dilapidated office block. It was dark, damp and fairly oppressive. There were trashed rooms, hidden corners, interactive areas, huge video installations and real life performances. I was impressed by the different mediums used and it was a pleasure seeing the photographic work of Estevan Oriol in the flesh. It would do the exhibition an injustice for me to try and describe how it made me feel in there. Also it may well affect people in different ways. For sure some aspects were haunting, some inspiring and some captivating. If you want a full sensory assault that will most definitely make you question human behaviour then get down there before it ends on the 27th October. Mel and I went for a beer afterwards and people watched from outside a pub on the Strand. Most interesting were the people coming out of the theatre having watched The Lion King. Wowzers. That was some crowd. On my way home I was thinking about what we'd witnessed and tried to rationalise things we do such as torture and war. I'm not going to say either of those things are right or wrong, I do concede that there are times when they are necessary. Here are some photos I took from the inside (click below), as you can tell the lighting was deliberately dim and I really wish I could give you some taste of the brilliant sound effects from around the rooms. My particular favourite was the dripping tap that went with the wooden bench with leather straps. I have done a quick Google search and there are a number of blog posts about this exhibition and a number of sites with great videos and reviews. Check them out but I implore you to get over there for real and experience it first hand. I will leave you with this video which is featured as part of the exhibition. It's the music video for UNKLE's track Hold My Hand. I am a fan of UNKLE and James Lavelle and this topped off the night for me. Be nice to each other, unless you really have to cause some pain, then do it justly and righteously. Peace.